as well as being cold enough to liquefy (and possibly solidify) atmospheric oxygen, which can be an explosion hazard. So my question is this: What process is currently used by space agencies to fill tanks with cryogenic hydrogen? Bossart led Mrazek out into the factory yard, where a Centaur tank stood gleaming in the sunlight. Mrazek asked, “What’s inside it?” To which Bossart responded, “Nitrogen.” Nitrogen was used for pressurization until the rocket was filled with its liquid-hydrogen/liquid-oxygen propellants just prior to launch. One of the most onerous was a fluid systems interface and the special requirements for dumping the liquid-hydrogen propellant if the mission had to be aborted. In late 1984, Johnson released a Centaur Safety Waiver (WACR-1A) that requested a redesign of the fill, drain, and dump vent system. The problem it wanted addressed was the placement of the liquid-hydrogen and liquid-oxygen vent line inlets below the propellant liquid level in case of a mission abort. Bottom line is, the rocket was filled with Nitrogen prior to filling. I can't find a source for it. They might have put Helium in it's place as well, or gaseous hydrogen, as a stop gap when filling it, but I can't find any sources for that bit of information. The existing answers do not accurately describe the procedure for the Space Shuttle system (or, I believe, for Apollo, but I am not 100% sure of that - see note at end of answer). The propellant tanks in the Space Shuttle's External Tank (ET) were never filled with nitrogen. The initial condition for LH2 loading into the ET LH2 tank was with the tank and lines at ambient temperature. The tank was pressurized with helium to 6 psi above ambient. The first step is to chill down the lines leading from the storage tank to the Mobile Launch Platform (MLP), through the MLP to the tail service mast, and through the Orbiter to the ET LH2 tank. To begin this process, the ET LH2 is vented to ambient by opening its vent/relief valve. Valves are commanded open in the transfer lines so that LH2 then begins to flow from the storage sphere through the lines mentioned above into the ET LH2 tank. Once the lines have been chilled down, "slow fill" begins. Helium is used to pressurize the ET LH2 tank to 24 psi above ambient. This pressure level is maintained by cycling the vent/relief valve as the tank is filled. LH2 then flows slowly into the ET LH2 tank until it reaches the tank's 5% level sensors. The next phase is "fast fill", accomplished by pressurizing the storage sphere to a higher pressure and opening the transfer line valve. LH2 flows rapidly into the ET LH2 tank until it reaches approximately 85% full. At that point, the main fill valve is partially closed to reduce the flowrate. This configuration is used until the 98% liquid level sensors in the ET go wet. At 98% the system transitions to topping - a slow fill to 100%. The transfer line valve and inboard fill and drain valve are closed, filling continues through the topping valve. The vent valve is opened, the ET LH2 tank is at ambient pressure. Now the tank has been filled to flight level and the system modes to replenish. The main fill valve is closed and LH2 is added to maintain 100% loading and make up losses due to boiloff. This configuration will be maintained until the tank is pressurized with helium shortly before liftoff to provide the proper inlet pressure conditions for Space Shuttle Main Engine start. 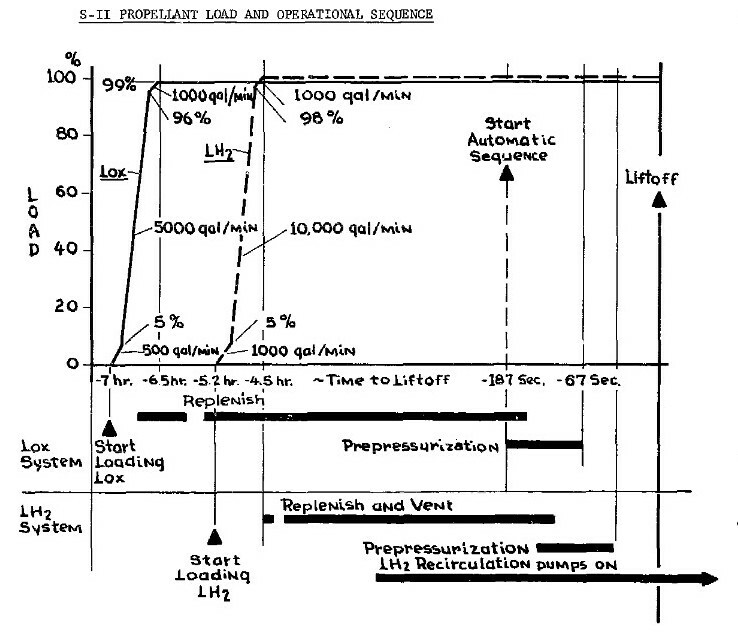 A note on LH2 loading in Apollo: This document provides a sketchy description of the process, but the supplied graph clearly shows a slow fill/fast fill/topping/replenish process similar to that of Shuttle. If the tank was filled with nitrogen gas before filling liquid hydrogen, we have a problem, liquid hydrogen is so cold that nitrogen gas goes solid. Therefore helium gas is better, it is still a gas at the temperature of liquid hydrogen. Solid nitrogen may damage or destroy the turbo pumps and fuel valves. Not the answer you're looking for? Browse other questions tagged fuel engineering rockets cryogenics or ask your own question. How are fuel leaks discovered on a rocket? Hydrogen balloon 'rocket' that uses the hydrogen as fuel?